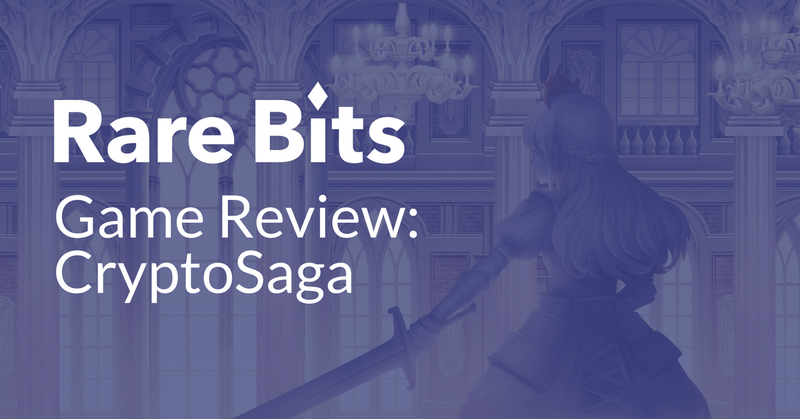 CryptoSaga is a new decentralized RPG that aims to change how we see games on the Ethereum blockchain. Like an RPG, you have heroes that you can train in order to send into dungeons to collect loot. One main difference with CryptoSaga is that it runs on WebGL. This makes CryptoSaga by far the most visually appealing crypto game on the market. Every hero and mob are carefully designed and animated (see below). This means you will actually see your swordsman brandishing his sword slaying his way through the dungeon looking for gold. Although collecting, training and trading heroes is the core of the game, there is way more than meets the eye. Heroes are acquired by purchasing Origin cards. Origin cards are on pre-sale until March 31st 2018 and can be purchased for ~0.1 ETH. Purchasing an Origin card can make you summon either a Heroic or a Legendary adventurer. If you don’t want to gamble with your luck, you have the option to buy a rolled hero at Rare Bits where you can find heroes as low as 0.03 ETH. Keep in mind that it is advised to have a party of 4 heroes for dungeons. All heroes are ERC-721 tokens which means every hero is unique with their own set of abilities and stats: HP, ATK, DEF, AGL, LUK. Since they are unique, the stat values are also different. By training your heroes you can make them stronger but this depends on the rarity of your roll. There are common, uncommon, rare, heroic and legendary heroes and their level caps are 15, 30, 50, 75 and 99 in this order. There are also certain dungeons that can be entered only if your hero has a certain rarity. Beyond states, heroes also have jobs, races, and abilities which can influence dungeon runs. For instance, if your hero is a Water Mage, he will easily kill all the fire mobs in the dungeon. Everyone knows that water beats fire. More info on the heroes here. Since there will be several dungeons to explore with different traits, players must choose their party accordingly. There is also a daily dungeon treasure that rewards players with a share of the daily amount collected that is determined by the characters level. These rewards are shared amongst the players at the end of the day and your share is calculated by the total power of your team. This is, if your team overhaul power is 500, and the sum of all power of the other players is 5000 you will take 10% of the daily reward (5000/500). The battling system itself will be based on the old 90’s SNES RPGs, where your party of 4 heroes will match against a party of 4 monsters and will attack each other on a non-controllable turn based system for 16 turns. The Arena is where you can put your heroes to the test, fighting other players in a 4 vs 4 bloodbath. Heroes BPs (overall score of the hero) are way less important than building a strategic team to fight against your opponent. Rewards in the Arena will be granted for top ranked players in ETH or gold. There is also a leaderboard and the possibility to challenge other players. There will be guilds you can create or join. The top 101 guilds of the game will receive a daily gold reward, shared amongst the guild members by the guild master. The auction is CryptoSaga’s market where you can sell your hero for a profit or buy new ones to make your team stronger. You can also trade your heroes in open markets like the Rare Bits marketplace. Moonrabbit is the team behind CryptoSaga. They are an indie game developer team from Seoul, Korea with games in their portfolio like FANTASYxRUNNERS and Fire Shrike. Cryptosaga is a promising RPG with the best visuals on the blockchain being developed by a strong and very active team. A marketplace where users can buy, sell and discover crypto items.